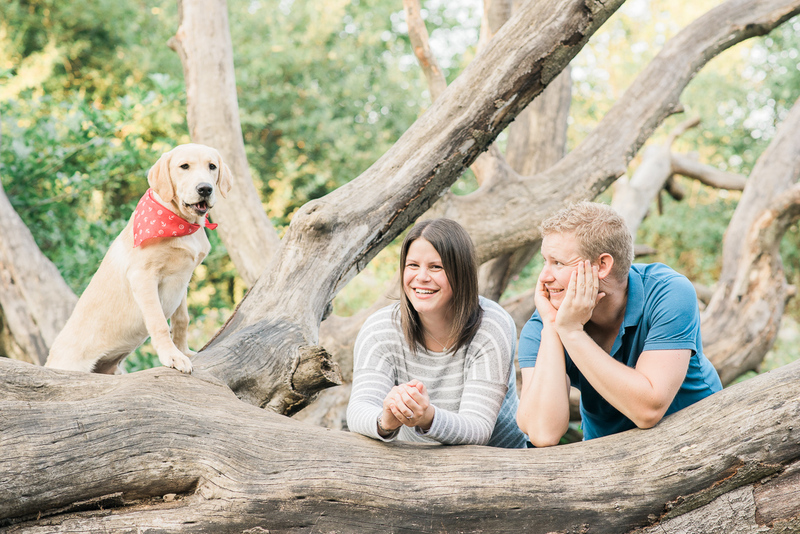 A few months ago I met up with Laura & Chris, whose wedding I’ll be shooting next year and who were keen to bring their puppy Finley along to their engagement session. My first thoughts were, hmm this could be tricky! 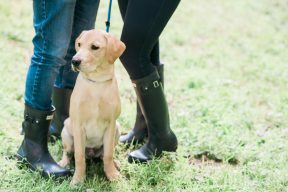 Images of a young dog bounding around the couples feet filled my head and I started to feel slightly anxious about it. 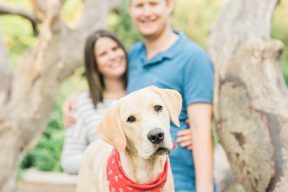 I had a few weeks to plan this shoot so I really put some thought into how to make this easy for everyone and being a dog lover myself, I knew a few things I could do to help get Finley the pup to play ball (excuse the pun) during this session. 1. 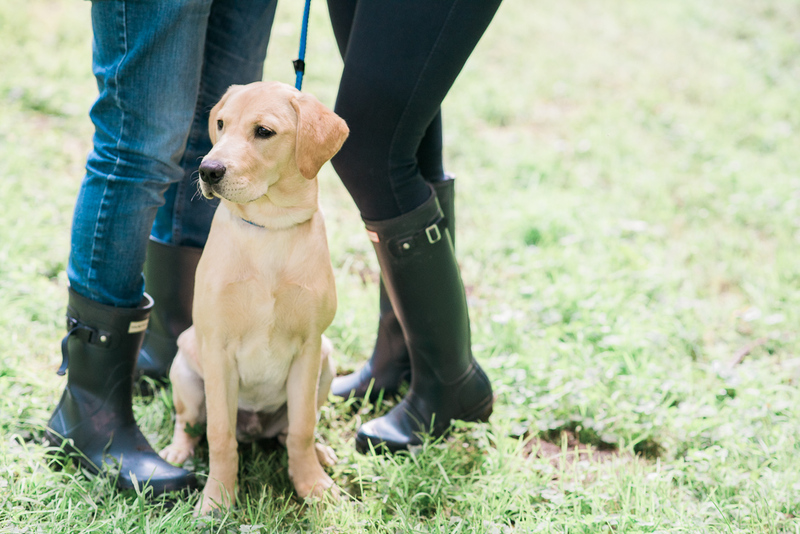 Take your dog for a walk first to tire them out – Definitely make sure your dog has been walked before bringing him out somewhere where you’d really like him to behave! A tired dog will mean he’s less likely to want to run around all over the place. 2. 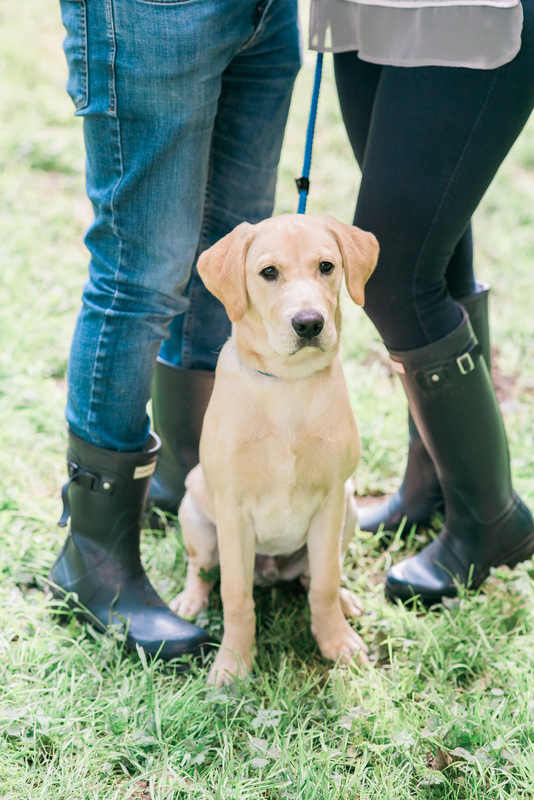 Bring treats – This is a very obvious tip but one that I would suggest to anyone wanting to bring a dog along to a shoot. My dog will literally bite your hand off for any sort of sweet but not all dogs are foodies like mine so bringing something extra special like small squares of cheese or chorizo. Something that smells a little bit better than their normal treats can help get their attention. 3. 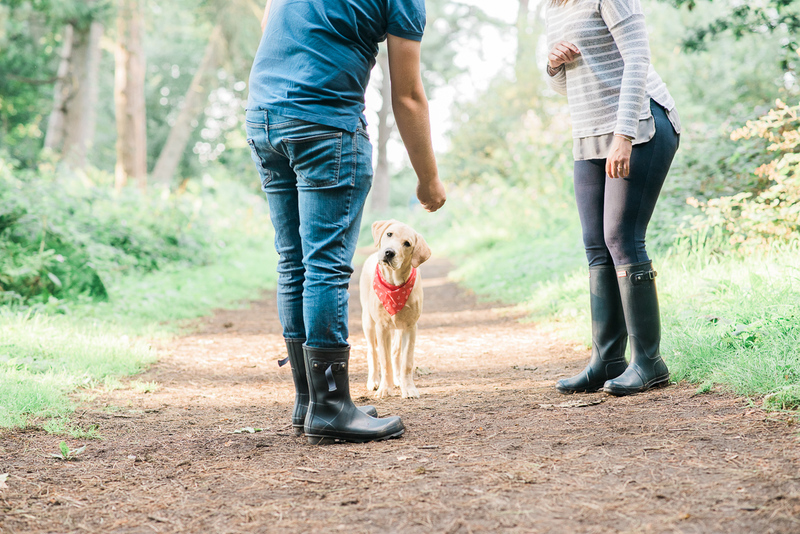 Have someone who can distract the dog – I am so glad I decided to take my partner with me on this shoot! 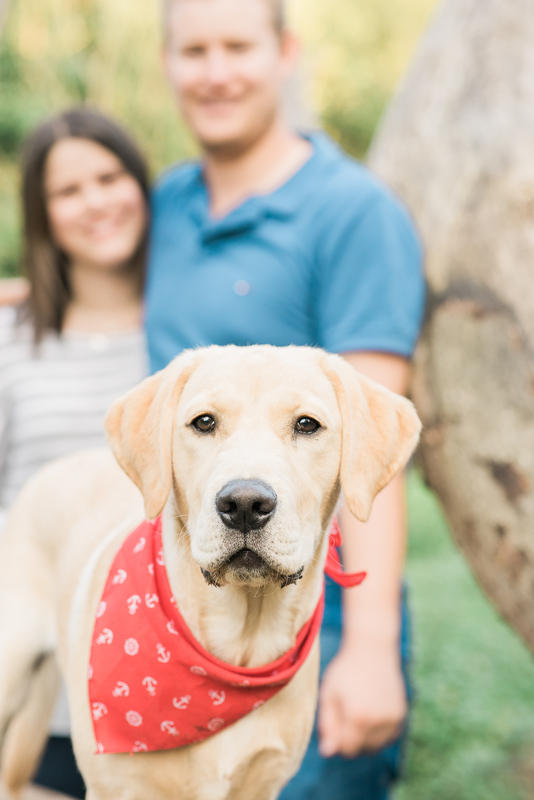 He is also a dog person and so he was more than happy to puppy sit whilst I did some images of Laura and Chris alone. I think this could be the most helpful tip of all actually as having someone else there to take the dog off for a walk was so helpful. But the most helpful thing he did was to jump up and down with a big stick behind me so that Finley looked in my direction with his head cocked to one side. It was super adorable and made the best images. 4. 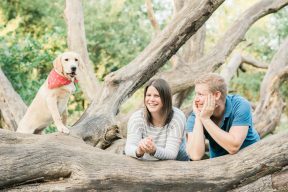 Go somewhere where there’s lots of variation for the dog – We did this engagement shoot at Badbury Hill where there were a variety of different locations to shoot. 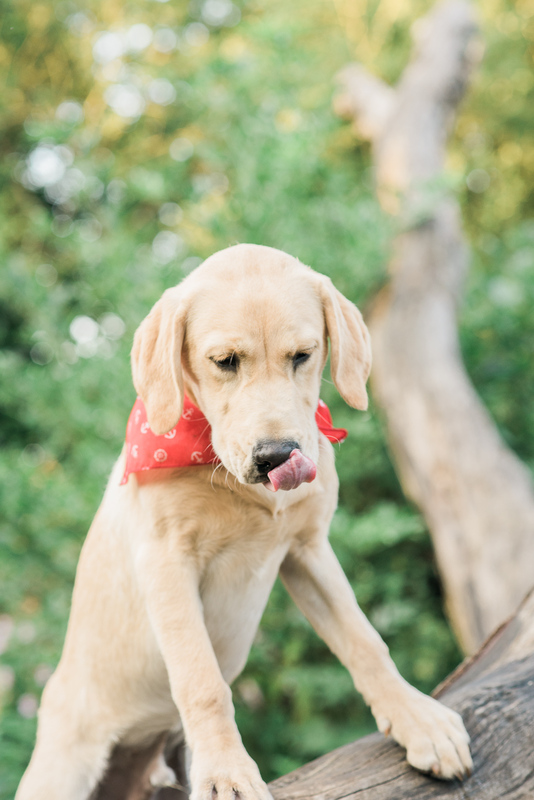 The best shots were taken on a big fallen down tree which Finley decided to climb and entertain us all. I basically let him do his thing then placed my couple near him and guided them into a few poses. 5. Don’t stress – This is so important! 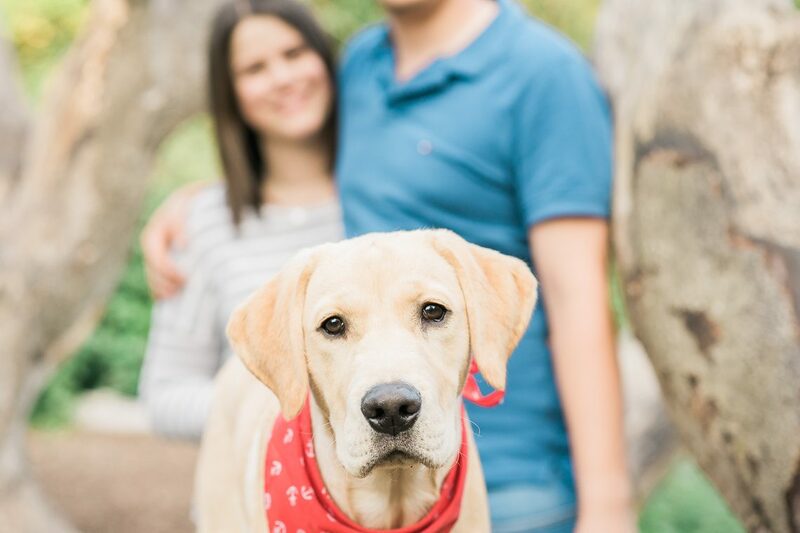 I tell my couples that the session will take as long as it takes for me to get beautiful images so I’m more than happy to wait and persevere with a dog. 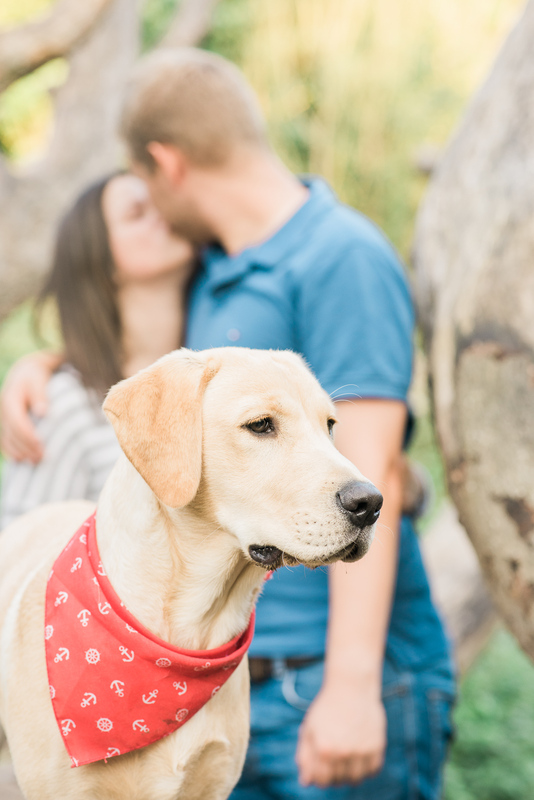 At some point your dog will start to relax and do something cute we will capture the perfect imagery. The more stressed you get, the more the dog senses it and is less likely to behave. 6. Noise – Sound apps are great for getting cute reactions off your dog. I used to use a sound app when I was doing a lot of equine photography where it’s really important to have the horses ears pricked forward. They do different animal noises so a barking app is great for making your dog stop and look in the direction of the noise. Squeaky toys are great too of course! 7. Smart accessories for your dog – Lastly I would suggest using a smarter lead than the one you would usually use. I walk my dog in an extendable lead but if I were taking him to a shoot I would probably get a nice leather lead and matching collar or a simple rope lead. Something that wouldn’t be too bright and stand out too much in the photos and something that would compliment the look my partner and I were going for too. 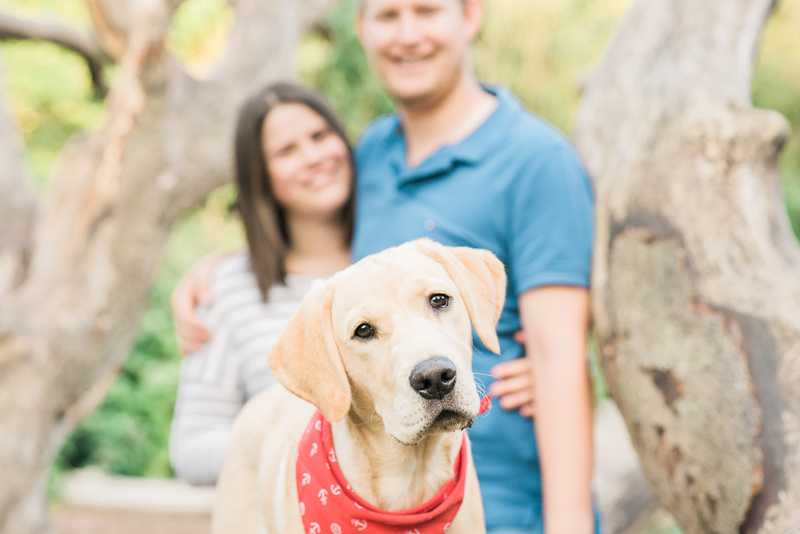 Laura and Chris chose a red scarf which worked really well against Finley’s creamy colouring. 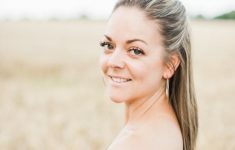 I'm a lifestyle blogger at This Life and Me and also a Wedding Photographer at Rachel Jane Photography! I love the outdoors and long quiet evenings with friends where everyone drinks too much wine and eats too much cheese. I love dogs. Like really really love dogs, especially ones with funny shaped heads, which is great seeing as my own dogs head resembles something similar to a rugby ball! I dream of living in warmer climates. With a vineyard. And a blue bicycle with a basket on the front. 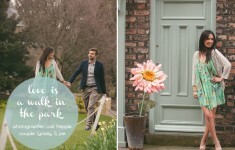 It’s engagement shoot central here at B.LOVED towers this week, and I am reveling in it.